Alderman Reilly is pleased to provide an update on a significant Public Benefit project currently underway in River North. 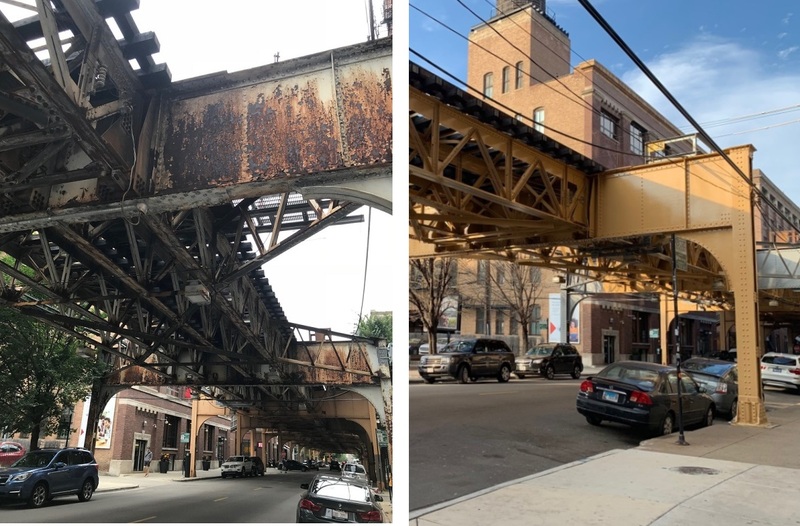 Neighborhood residents and local neighborhood associations have reported concerns regarding the rusted and unsightly appearance of the CTA Brown Line structures that run along Franklin Street. Although the Chicago Transit Authority is a separate governmental agency that operates outside the purview of the Chicago City Council, Alderman Reilly (in coordination with CTA and Chicago Department of Planning and Development) created a density bonus fund that allowed him to commit private development dollars from nearby projects to this significant infrastructure improvement project. In 2018, Alderman Reilly secured local impact funds from three private development projects (142 West Hubbard, 300 West Huron and 110 North Wacker) to repaint 895 feet of the Brown Line tracks, from just north of Huron Street to just south of Ontario Street. Phase I of the project, which included painting the tracks between Huron Street and Superior Street, is now largely complete. Before and after photos of the recently painted CTA structures at the intersection of Huron and Franklin are included below. Phase II, which will include the painting of two support columns from Phase I limits and will continue south, is expected to commence in mid-Spring 2019. Work cannot begin until we have consistent milder temperatures to facilitate the painting work. Stay tuned to Reilly Reports for future updates on this significant infrastructure improvement!